This peer-reviewed journal intends to serve as a forum for the ongoing philosophical and legal discussion of the possibilities of thinking and action that are called for when one applies natural law theory, whether Platonic, Aristotelian, Ciceronian, Thomistic, or Kantian in its orientation, or is a product of more recent twentieth and twenty-first century contributions to the tradition. Theories of natural law have been under attack since the Enlightenment, but they still recur in old and new forms within both the academy and courts of law. The idea that human nature possesses an inherent sense of moral obligation no matter the culture, environment, or historical epoch is one that simply will not be eradicated by modern and postmodern assumptions about the varieties of nurturing and the physical basis of the mind. 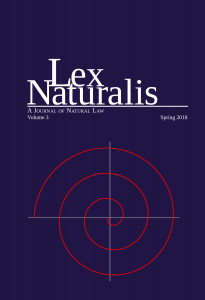 In Lex Naturalis, these ethical questions that challenge our contemporary world as well as the relationships between natural law and related fields such as constitutional law and international law are examined, explored, and elucidated. The journal seeks to present the vitality and variety of thought within that community of intellectuals who cannot and will not separate ethics from the conclusions that have been and are still being drawn from natural law. 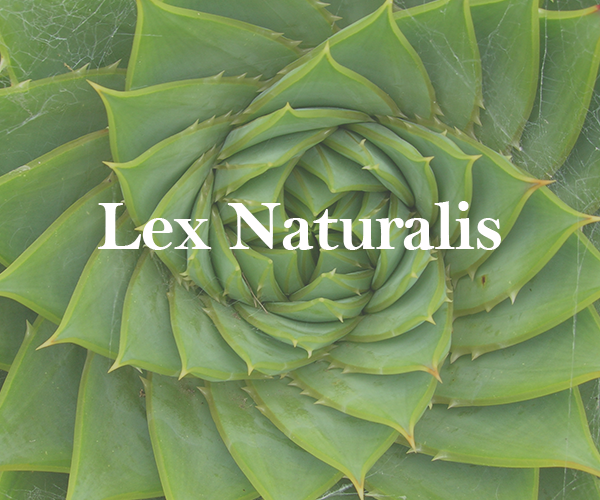 Volume 3 of Lex Naturalis will be coming out Spring 2018. 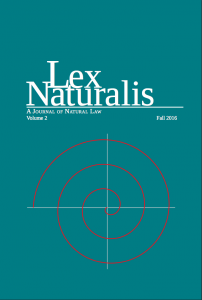 Lex Naturalis : A Journal of Natural Law, is a continuation of the journal Vera Lex, which was published by Pace University Press from1980-2010. Articles in Volume 3 include a natural law examinationof Bartolomé De las Casas and his contributions to the development of human rights, and a look at the status of animals within a Catholic natural law framework. 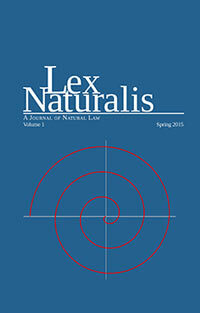 Lex Naturalis is devoted to the relationship between human nature and non-human nature in natural law theory. Among the articles in this second volume are explorations of the papal encyclical Laudato Si’ and an examination of Germain Grisez’s Natural Law, bringing together scholarship on current ethical debates to explore meaningful environmental relationships. Reviews of recently released books on natural law are also included. 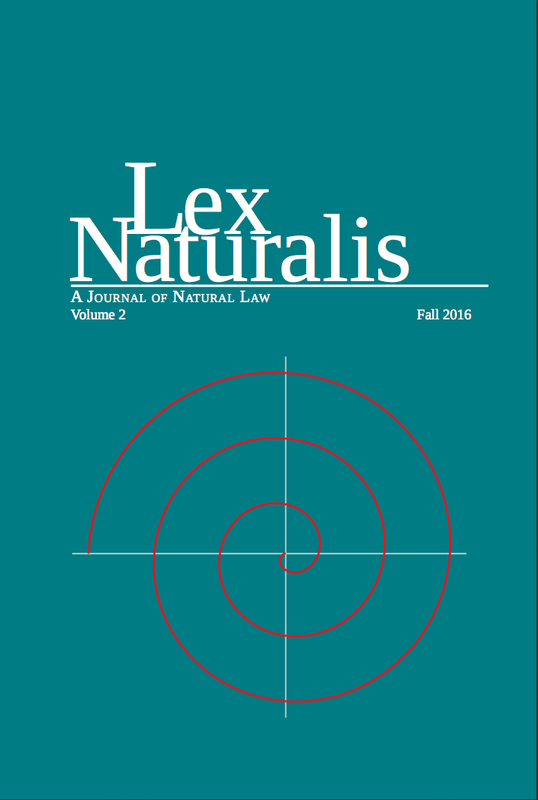 The first volume of Lex Naturalis includes new essays that contemplate natural law theory in the context of contemporary philosophical and legal discussions and debates, as well as Robert Chapman’s book review of Plato’s Revenge: Poliics in the Age of Ecology by William Ophuls and Richard Connerney’s review of Economic Justice and Natural Law by Gary Chartier. Essays in this volume include: The Natural Law: Theoretical Insights and Prospects for Renewal from G.E.M. Anscombe by Zachary Mabee; Ars Legis: Reflections on Aquinas’ “Christian” Articulation of the Natural and Human Law by Jeffrey Walkey; and Spaemann’s Critique of Nuclear Energy: A Renewed Natural Law for the 20th-21st Centuries by Gregory Canning. Several of [Hart’s] main objections have more to do with the traditional meta-ethical foundations upon which natural lawyers have built their theories than upon anything conceptually tied to the principle of lex iniusta of necessity. […] It is easy to see that these criticisms of natural law have little to do with the contents of lex iniusta and far more to do with the meta-ethical theories which natural law theorists tend to hold. Probably the most misunderstood part of Aquinas’ teaching on the natural law is his teaching on the natural inclinations. It is often assumed, even by some eminent Thomists, that the natural inclinations Aquinas speaks of are feelings, desires or urges which provide us with basic data which inform us of the content of the natural law. But if that is so, how could the natural law be what Aquinas calls “law,” which is an ordinance of reason? In a word, Anscombe is quite convinced that [law conception of ethics] is properly intelligible within a broader tradition or context in which God is held (among other things) to be the ethical legislator. Since the Judeo- Christian context for [law conception of ethics] was lost in the West (by, say, the time of the Reformation), philosophers have variously — but in futility, she thinks — attempted to offer ingenious quasi-legalistic interpretations of morality. Critics argue that Aquinas cannot be thought to have proposed a strictly philosophical account of natural law, because the “treatise” itself is articulated within a work of Christian theology by a Christian theologian for a Christian audience. […]I argue that Aquinas’ intention is nonetheless to present an account of natural law in which its principles and determinations are universally accessible. While the precepts of the natural law are grounded in real potency based on the natural dynamism of being, Mill bases possibility on the desires that can be predicated of man, even those desires deficient of the fullness of being. This lack of specificity and objectivity means that Mill’s theory can never establish any precept with the certitude necessary to provide people with the security he seeks to establish. One could say that Spaemann believes that the content of natural law has not changed—we still have the same duties toward our contemporaries as did our ancestors toward theirs—but that our understanding of what’s involved in a conception of natural law needs to be greatly expanded.71 Of course, a renewed appreciation of being/nature would be entailed by such an expansion of natural law. From the practical point of view, for example, the similarity between An-Na‛im’s and Maritain’s theories seems to lie in the superior, normative role that natural law plays with respect to, on the one hand, the public laws of the State and, on the other, the religious norms contained in the Bible or the Qur’an. In the same way that Maritain judges the Mosaic law on polygamy as surpassed by a more modern understanding of the exigencies of natural law, An-Na‛im interprets the Qur’anic rules on polygamy as contingent to the time and place of the prophet Muhammad and contrary to enlightened understanding of reciprocity. It is a commonplace that the term “natural law” includes a variety of different ethical theories that break with the traditional Thomistic system. By favoring the “new” sciences of ecology, physics, and psychology over those that insist on an appeal to the will of a providential God, Ophuls breaks with tradition, but only by degree. What he finds in the natural laws of the new sciences is a way back to a more sane economic/political arrangement based on virtue. Chartier’s book promises a pecuniary golden mean that avoids the ideological extremes of socialism and Randian objectivism, a conception of fiduciary morality that promotes worker’s rights without the interference of a paternalistic state and prescribes fair distribution of income without fostering a culture of dependence.